FORT MYERS, Fla. - It was the great Bob Ryan who wrote, "Beat me, whip me, take my picture," back when ballplayers from foreign lands enjoyed getting their butts kicked by the 1992 US Olympic basketball team. We had a little bit of that at City of Palms Park yesterday. It was "college day" for the world champion Boston Red Sox. Still jet-lagged from their whirlwind trip to the White House (seen the photo of David Ortiz riding a sidecar yet? ), the Sox returned to Florida and opened their spring season with a day-night doubleheader against Boston College and Northeastern. The Sox won in straight sets, 24-0, 15-0. "This is our best day of the year - until we get to the [College] World Series in Omaha, that is," said Boston College lefthander Steve Cadoret. It wasn't the Eagles' best day on the diamond. The awe was evident as the nervous collegians had trouble throwing strikes (BC walked 15 batters) and catching baseballs falling from the high Florida sky. The pasty Eagles and Huskies have been working indoors for the last several weeks, and the rust and jitters were obvious all day/night. Though the temperature was unseasonably chilly (57 degrees at 1 p.m.) and the competition soft, the Sox nearly filled City of Palms twice. It's been four months since the magic Sunday night in Denver, and Red Sox Nation is hungry for hardball. We are, after all, the only baseball town that would dare put two hours of pitchers' fielding practice on live television. And when you put starstruck college kids around a batting cage populated by the likes of Ortiz, Kevin Youkilis, and Mike Lowell . . . there will be photos. And autographs. BC's Cadoret, from Sterling, Mass., was one of the college players who broke the ice with the champs late in the morning. Before you could say, "Boola-boola," the college players were posing for photos and offering balls and hats to be signed by the Sox. Ortiz, naturally, was a magnet, and he made the kids feel at ease, telling one Eagle, "I got to take you to my barber, man." Youkilis, meanwhile, told the guys he likes to get Chinese takeout at Rice Valley in Newtonville. There were stars everywhere you looked when the Sox and Eagles got loose for the first game. Curt Schilling sat in the third base dugout, wearing a headset, doing a live radio interview back to the Hub. Boston's Mayor Tom Menino - trying to avoid having his picture taken with a palm tree in the background - did the meet-and-greet in front of the Sox dugout while "60 Minutes" man Morley Safer interviewed Red Sox owners for a piece on Bill James. Underneath the stands, the World Series trophies were available for photo opportunities. "This is a nice day for us," said Sox manager Terry Francona. "It's a perfect way for us to start our season. I'm sure [the college players] are excited, but it really works well for us." In baseball parlance, it's called getting your work in. The Sox needed to get their work in. Josh Beckett needed to get his work in. Manny Ramírez needed to get some swings against live pitching. Beckett got his work in. He pitched two innings, six up, six down. He struck out four, two looking. He threw 25 pitches, 18 for strikes. All eyes were wide open in the first base dugout every time Beckett went into his delivery. BC senior outfielder Ryan Akel struck out looking on a 1-and-2 pitch to start the game. Senior Harry Darling grounded to short and senior Brandon Ziemann, who homered against the Red Sox last year, struck out swinging. It was more of the same in the second inning. Eric Campbell, the Eagles' cleanup batter, flied to center against Beckett to start the second. "I hit a 1-2 curveball against Beckett," said Campbell. "I don't think he was at the top of his game, but he's pretty good." Campbell singled off Javier Lopez to start the fifth. He was BC's only base runner of the seven-inning game. "Lopez threw me a first-pitch fastball," said Campbell. "Thank God for the hit. That day was ugly enough as it was. In a game like this, you pretty much know you're going to get blown out, but it's still a good experience, especially for the freshmen. 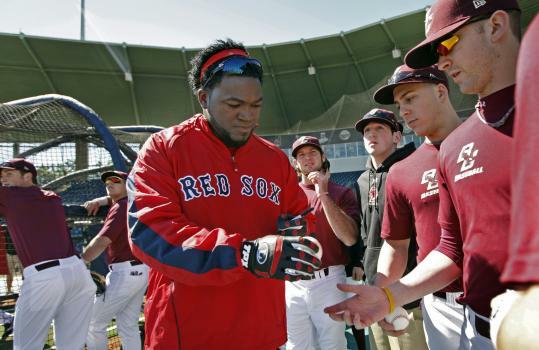 It's good to see the looks on their face the first time the Sox take batting practice." BC starting pitcher Ted Ratliff retired Jacoby Ellsbury, Dustin Pedroia, and Ortiz, in order, in the top of the first. "I jammed Jacoby," said Ratliff, a senior from Illinois. "I think I broke his bat. Pedroia lined a curveball off my arm, but it bounced right over to Eric [Campbell, the third baseman]. Ortiz is a little scary. He basically got himself out [popup to short] on a fastball down and in. "This is living the dream," added Ratliff, a special education major. "These are the guys we all idolize." That's why it's a good day. No one will mention the final score when future generations of Ratliffs gather and talk about the day granddad retired the world champions 1-2-3 in the first inning of the 2008 Red Sox season.